While some extrusion machinery makers are keeping their new technology under wraps, waiting to showcase at the K2013, others are keen to share their new developments, which focus on efficiency and materials savings. Following its launch of a low cost highly standardised dsX flex-pack extrusion coating line for the Eastern Europe and Asian markets at Chinaplas, US-based Davis Standard will show a compact in-line pre-stretch cast film line. The 2-m wide dsX stretch line enables the processing of thinner films of 6 microns, at higher speeds of 1,000 m/minute. It has a lead time of six months and is available in both five and seven-layer options. Meanwhile, Austria’s SML will showcase its modular SmartCast sheet line. The 3-m wide line in a 6-up configuration offers a choice of four preconfigured extrusion units, with outputs ranging from 1,700-2,400 kg/ hour, and in five or seven layers. SML has also upgraded the chill-roll unit by adding more functions, minimising vibration and making it easier to operate. Rounding up is the newly developed W4000-4S winder that makes machine and jumbo rolls on 3-in. cores and hand rolls on 2-in. cores. It offers both coreless and thin-core technology and has an optional edge-encapsulation system with speeds of up to 750 m/minute. US firm Welex will display its new Converge CTS Sheet Line, which uses conical twin-screw extrusion technology as opposed to the more typical parallel designs offered by other suppliers. The line is for undried PET and PLA sheet. German firm KraussMaffei Berstorff has developed a pilot/laboratory line for foamed sheet, to provide an economical line for testing new processes. It comprises a modular twin-screw ZE 40 UTXi Modular for material melting and mixing and a KE 90 single-screw extruder for melt cooling. In BOPP processing, Germany-based Brückner Maschinenbau will introduce faster lines, with upgraded machine and transverse-direction orientation (MDO/ TDO). A new MDO has automatically adjustable contact rolls for more stable production at high speeds while the TDO features a new geometry for more efficient power transmission. In BOPET film production, Brückner is also upping the ante by boosting line speeds. Web-pinning to the chill roll is optimised by a new automatic control system that allows the PET film to run at high speeds without pinningagent additives. The MDO has what is said to be a “twogap stretching”, fitted with adjustments for a closed power flow. In the TDO, a new low-vibration transport system ensures optimal stability at high speed and longer life span. Vienna-based Battenfeld-Cincinnati will display its Multi-Touch sheet roll stack. 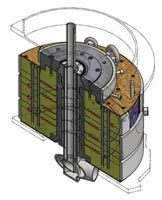 While conventional film and sheet cooling units consist of three-roll stacks, the Multi-Touch has a larger number of roll nips and achieves reliable cooling of the film on both sides. The new roll stack is equipped with a two-roll roll stack for preliminary calibration and three, five or seven rolls for final calibration. The first rolls come with a larger diameter to minimise deflection, followed by smaller rolls, thus producing film with low tension and perfect flatness, says the firm. German firm Reifenhäuser will introduce the patentpending Mirex MT polishing stack that allows for automatic digital nip adjustment, even during production runs, without the need for manual, trial-and-error nip adjustments that require the line to be stopped. With no hydraulics, the Mirex MT is suited for clean rooms. It is available in three designs: Smart (for PS/PP processing with an output of up to 1,200 kg), Standard (output of up to 3,000 kg) and High Quality. In blown film, Reifenhäuser-Kiefel Extrusion will display the Evolution Ultra Flat unit, a new film-flattening device that is installed between the haul-off nip-roll assembly and turner-bar system, where stretching and flattening can take place easily because the film is still warm. The amount of stretch can be adjusted by the heating and cooling rolls. Thus, producers are able to adapt the process to the individual requirements of the different end products and counteract sagging of the web. The result is faster and easier conversion at high speed and less waste. Canadian supplier Macro Engineering & Technology will introduce a coextrusion die for up to 11-layer barrier films, to produce structures using PA (Nylon), EVOH, PETG and PVdC. The FlatPack die features round flow channels throughout, streamlines the flow of polymer to optimise residence time distribution and shorten residence time, compared to previous Macro dies. This reduced residence time is said to eliminate interfacial instability making the die more versatile for a wider range of film structures. The die also features shortened purging times, allowing processors to perform faster product changeovers with reduced scrap produced. The FlatPack also gives processors the added flexibility to allow major film structure adjustments by swapping layers, such as reconfiguring a A/B/C/D/E structure to A/C/D/B/E. Other features are a short height and up to 760 mm die diameter. Also shown at Macro’s booth will be a nine-layer CenterPack coextrusion die, which Macro recently upgraded to improve processing versatility and reduce residence time. US firm Cloeren will show its patent-pending moebius-manifold die for flat film and sheet. It is available in three versions: single-layer, coextrusion and with Cloeren’s patented IDS (Internal Deckle System). A varying aspect ratio is used, with the initial larger teardrop cross-section, which is located at the centreline, transitioning to a smaller cross-section along the width to the manifold end. It is, thus, able to maintain a constant manifold length by varying the transition angle of the manifold and in turn minimises chamshell deflection. For packaging applications, Battenfeld-Cincinnati’s latest high-speed extruder is capable of a speed up to 1,500 rpm. With a screw diameter of 75 mm and a 40 D processing length, it requires up to 25% less energy compared to a conventional extruder. It also ensures optimal melt for PS, PET, PP and EVA and reaches outputs of up to 2,000 kg/hour. Battenfeld-Cincinnati has also developed a new antiwear concept for planetary roller extruders, which are being used for applications such as calender feeding and pelletising. With the new L+ planetary spindles, uptime can be increased by up to 50%, which also leads to a reduction in steel consumption and workloads. For PET applications, Battenfeld-Cincinnati will showcase its specialised single-screw extruder with an integrated compounding section for outputs between 500-1,000 kg/hour. The firm says up to 16% of energy costs can be saved by processing un-dried PET. Meanwhile, Reifenhäuser will unveil a novel extruder line dubbed Evolution. It will feature an innovative plasticisation concept called Energizer that minimises energy and runs without barrel cooling. Melt temperature is reduced by as much as 20°C. The extruders will be available in diameters from 30-150 mm with 30:1 L/D and a new drive technology that will allow processors more flexibility to select the motor type and motor-cooling method. For pipes, Battenfeld-Cincinnati will launch the GL (gearless) version of its solEX single-screw extruders that debuted at K2010. It features a smaller footprint (because there is no gear box) and has a new hightorque motor, said to be more energy-efficient than conventional motors. Available from 45-90 mm sizes, it also offers lower noise and vibration levels and requires virtually no maintenance. For PVC window profiles, Battenfeld-Cincinnati will show a conEX 63 P conical twin piggybacking on a twinEX 78-34P extruder that is able to run regrind. 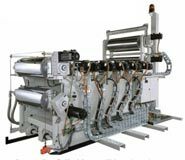 The energy-saving counter-rotating twin-screw extruders share a common control cabinet. When up to 40% recycled materials are used to process, the line can achieve an output of about 500 kg/hour. KraussMaffei Berstorff will display an enhanced version of QuickSwitch, which allows the ability to switch from one pipe size to another. It now includes the 250-450 mm diameter range and can be equipped with the company’s cost-saving internal pipe cooling (IPC) technology, where the pipe is cooled from the inside using ambient air, which is suctioned with help of a side-channel compressor. As well as reducing space and investment costs, it reduces the need for cooling water. Austrian firm Theysohn Extrusionstechnik will display its new CON 68 conical twin-screw extruder, developed specifically for duct, pressure and sewage pipes of up to 110 mm and outputs of 350 kg/hour. Theysohn will also show a three-layer PVC pipe system with a foam or regrind material core and a dual-strand line for PVC pipes of up to 3 in. Italian firm Sica will present its TRS 160 W cutting machine for PVC, PE and PP pipes, which it says can cut and chamfer without removing material, thus saving on raw material and avoiding scrap suctioning and recycling. Also, the new equipment removes chips and dust that end up partially between the saw mechanisms. Other new products are the Multibell 200M belling machine for PVC sewage pipe, enhanced to reach an output of 900 sockets/hour, and the Everbell socketing machine for processing PP pipes. Meanwhile, Davis-Standard will display its compact dsX med-tube medical tubing line. Designed for clean rooms, it features language-specific control systems and faster delivery. A unique eco-extruder arrangement allows for processing materials ranging from PP to FEP by changing feedscrews. The line includes a melt pump on each extruder for processing thermoplastic polyurethane (TPU), nylons, and other medical grade material.